With some Democrats calling to abolish Immigration and Customs Enforcement, congressional negotiators want to cap the number of the agency's detention beds. As the clock ticks toward a Friday deadline to avert another partial government shutdown, a new stumbling block has emerged in talks between congressional Democrats and the White House: Immigration and Customs Enforcement detention beds. The Trump administration said last month that it wanted $4.2 billion to support 52,000 detention beds. "Given that in recent months, the number of people attempting to cross the border illegally has risen to 2,000 per day, providing additional resources for detention and transportation is essential," the White House said. But Democrats are seeking to cap the number of detention beds. In a statement Sunday, Rep. Lucille Roybal-Allard, D-Calif., asserted that "A cap on ICE detention beds will force the Trump administration to prioritize deportation for criminals and people who pose real security threats, not law-abiding immigrants who are contributing to our country." The Trump Admin has been tearing communities apart with its cruel immigration policies. A cap on ICE detention beds will force the Trump Admin to prioritize deportation for criminals and people posing real security threats, not law-abiding immigrants contributing to our country. Roybal-Allard chairs the House Appropriations subcommittee on homeland security and is a member of the House-Senate conference committee trying to reach an agreement on spending levels. 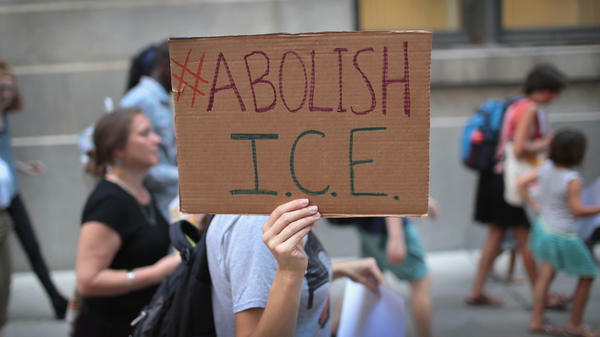 "pursuing an out-of-control deportation policy focused on removing immigrants with no criminal records, many of whom have deep roots in their communities. This approach is cruel and wrong. A cap on detention beds associated with interior enforcement will rein in the Trump administration's deportation agenda." Democrats say a cap of 16,500 would restore immigration enforcement to levels in place at the end of the Obama administration. A House Democratic aide speaking on background said Democratic and Republican negotiators had agreed to reduce funding overall for ICE detentions to a range between 34,000 and 38,500 beds by the end of the year. In a briefing call on Monday, ICE Deputy Director Matt Albence said any cap on detention beds would be "extremely damaging to public safety." He said ICE is currently detaining 20,000 to 22,000 individuals in the interior of the country, away from the border. In a Sunday interview on Fox Business, Sen. Lindsey Graham, R-S.C., said of the Democratic position, "Not only is it enough they want to abolish ICE. They want to abolish the bed spaces available to the country to house violent offenders so they can be held and deported." Graham added, "I promise you this: Donald Trump is not going to sign any bill that reduces the number of bed spaces available to hold violent offenders who come across our border. He can't do that. He won't do that, and you can take that to the bank." President Trump tweeted on Monday that "The Democrats do not want us to detain, or send back, criminal aliens! This is a brand new demand. Crazy!" The Democrats do not want us to detain, or send back, criminal aliens! This is a brand new demand. Crazy! But Democrats say they want nothing of the sort. Roybal-Allard said the cap will ensure that the Trump administration "targets violent felons and other people who pose security risks for deportation, instead of pursuing reckless mass deportation policies that actually make us less safe."